Image: Marvel Comics. Exiles art by David Marquez and Matt Wilson. 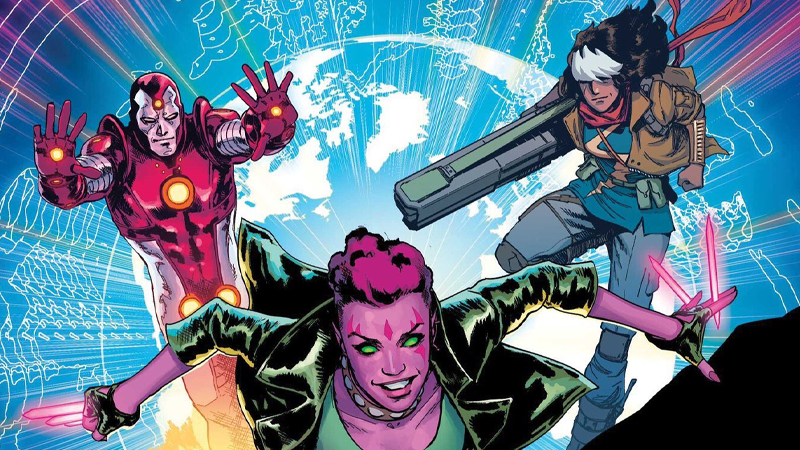 The Exiles were Marvel’s premier dimension-hopping band of merry, reality-twisting heroes. Although they were originally primarily a mutant team, eventually they became host to all sorts of weird and wonderful alt-takes on Marvel’s finest heroes. Now the team is making a grand return, and bringing some fresh takes on familiar faces. Exiles will be written by Black Bolt’s Saladin Ahmed, with art by Javier Rodriguez, Alvaro Lopez, and Jordie Bellaire, and letters by Joe Caramagna. Although teleporting X-Men associate Blink (specifically the pink-skinned version from the Age of Apocalypse timeline) will return, she’ll be the only character from Exiles rosters of the past. The new team, created at the orders of the Unseen—a.k.a. the original Nick Fury, after the events of Original Sin saw him bound to watch over the Earth from the mon—to tackle an cross-dimensional threat to the Marvel multiverse, will include: Iron Lad, who looks like a weird hybrid of classic Iron Man and the Vision; Khan, a grizzled, dystopian adult version of Ms. Marvel; and Wolvie, an absurdly cute, cartoony Wolverine. The quartet will be joined by a fifth mystery member blacked out on the first cover, so start speculating wildly as to who that could be—bearing in mind there’s the literal entirety of the Marvel Multiverse to choose from. Given how much we’ve been bowled over by Ahmed’s work with Christian Ward on Black Bolt, we can’t wait to see what he does with the keys to every reality in the Marvel multiverse. Exiles is set to return this April.